Because I’m a typical fashion blogger and a horrible cliché, I’ve been coveting Mulberry bags since I started A Little Bird Told Me three years ago. There’s just something about the brand – maybe it’s the butter-soft leather, the always-on-point designs or the British heritage – that draws me in. I adored the Alexa, loved the Lily and dreamed about the Del Rey, and had been planning my purchase for quite a while, but never quite made the leap. And that’s probably because, despite the beautiful craftsmanship and timeless design, Mulberry bags are HELLA expensive. Although I’m growing accustomed to paying £200 for a nice dress (hello Whistles), I still think £800+ is an insane amount to spend on a bag. That’s more than my monthly rent. It’s scary. But, that niggling ‘must-have-a-Mulberry’ feeling stuck with me, and I found myself idly browsing the site, researching. Eventually I stumbled on a slightly different, yet still official, site. One that listed all the Mulberry Factory Outlets in the country… including one in York. My hometown. 45 minutes away from my house and a city I visit often. HE-LLO. Unlike the Bicester Village store, the York Factory Shop was quiet. Well, there were people in there – quite a few of them, in fact – but it didn’t have the frenzied, bargain-hunting feel that Bicester had. The staff had time (and space) to talk to you properly, explaining why items were reduced. Many pieces in the York store were new season – there were plenty of Alexas and a couple of Lilys – reduced because of slight damage. And when I say slight, I mean the tiniest marks in unreachable places. 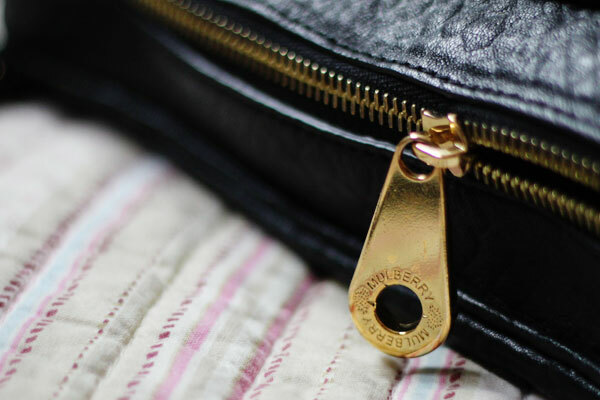 Turns out Mulberry are real perfectionists. I had an idea what I wanted when I walked inside – something more refined than the Alexa, so I could use it for night as well as day. But bigger than the Lily, to lug around all my useless possessions. 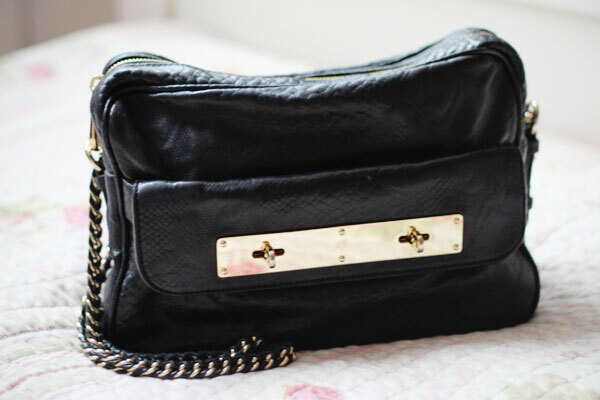 Classic black to go with every outfit, and maybe some gold hardware to give it a ‘rock edge’ (fashion speak). I tried on a few styles – a small Alexa in black, a classic Bayswater… and then spotted it, as part of a display on the top shelf. One of the girls from the shop helped me get it down and we cooed over it together. The snake print leather, as butter soft as I’d been promised. The perfect day-to-night size. Gold hardware. A chain handle. I was in love. Jade, who helped me in-store, was fantastic – she showed me a few different ways to wear it (the chain handle can be looped short or left long), let me walk up and down with it on, twisting and turning in the mirror until I was happy. She also told me why it was reduced – a tiny grey mark on the leather, noticeable to only the sharpest eyes. I took my Mulberry Carter Snake to the till and paid up. The originally RRP was £795 and I paid… £537. Still a steep price, but one I was happy to pay for such an investment piece. The bag is my ‘well done for getting to NYFW’ present and represents a year of crazy hard work to get my freelance business off the ground. I’ve used it every day since the beginning of September and my love for it shows no signs of abating! If you’re thinking about your own Mulberry purchase and want to explore a cheaper option, I’d definitely recommend a visit to one of their Factory Shops. The shops also sell accessories and clothing – be careful with that credit card! 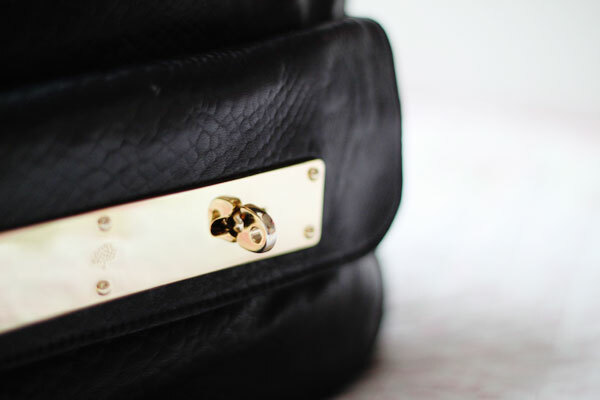 Do you own a Mulberry bag? Like you, I’ve lusted after Mulberry bags for years. Well done on taking the plunge finally! And what a great choice in bag too. York’s a bit far for me to travel, but if I do find myself heading that way, I will know where to browse for Mulberry bag deals. I will take the plunge myself eventually too, I just need a made-up reason to treat myself! Out of Lurkville to tell you i too love Mulberry bags. I have the Alexa in Oak (oversize) RRP £935. I paid £620. Steep i know but my husband bought it for me for making a decsion i’d been putting off for a while regarding my career. He was willing to pay full price so a bargain i reckon. It was from the mulberry shop in cheshire oaks, which is hit and miss with stock. Now i’m lusting after a bayswater east in black…..
That’s a fantastic saving, Sharron! I think you’ve got to make quick decisions when it comes to factory stock but if you’ve done your research beforehand and know what you want it’s easy to take the plunge. Great choice Jen! I’d love to save up and treat myself to one.. and when I do I’ll be heading for a factory shop! what a lovely bag. I bought my first Mulberry in their summer sale this year and have been using it almost every day since. I think i need to get to the outlet too! Oh my god. Ohhhhh my god, there are none near me and I’m now in a full blown (internal) strop! So annoyed as well, my first boyfriend lived in Wirral and we used to go to Cheshire oaks ALL the time, but I refuse to drive from MK to there for a bag when the petrol will cost loaaaads and its a 5 hour round trip haha! Oh wow, that bag is stunning!! 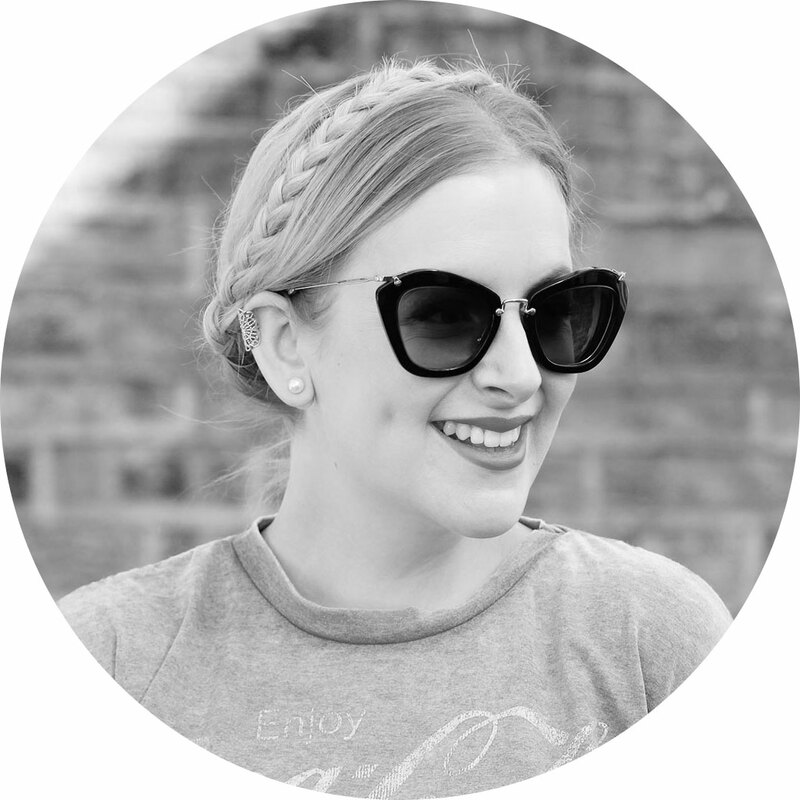 This has been such an interesting post to read – I desperately want a Mulberry but as a student they’re totally out of my reach at the moment. I’m planning on saving up for one and will now be stalking these outlets! I visit the York shop when I have a girls day shopping and it’s as you describe – busy but not mad. The price points mean I walk away empty handed but I still like to coo and stroke the handbags. Lovely choice Jen, Mulberry bags are amazing & I love to think I’m buying British. I was gifted the oak Alexa as a graduation present and I’ve used it almost every day since July 2010 and its still going strong. It’s cost per wear that counts! 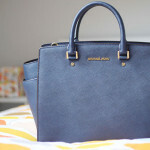 The day I can buy myself a Mulberry would be one of the happiest day of my life! You picked a great one. It has all the things a bag should have. I have a black Alexa and a tan postmans tote. Paid full price for them but I love them. Opps that should read clutch not tote! 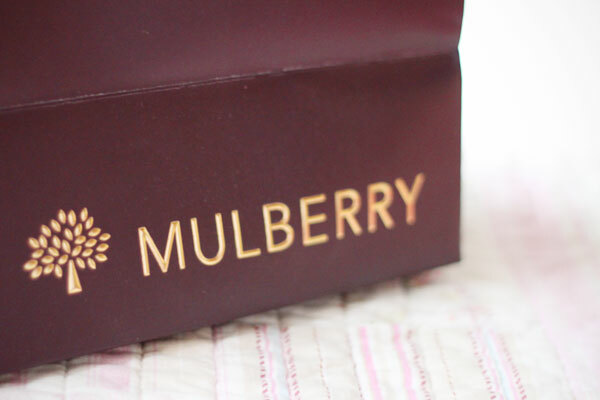 I definitely have a bit of a Mulberry obsession too! Currently my collection stands at 3 but now knowing there are better outlets than Bicester (which I totally agree with you about), I may just see this growing! My best friend knows someone who works at the Mulberry factory (not too far from my house…I keep hoping to see a finance job there!) and this sort of “defect” is pretty normal for something to be rejected! I love the outlet shop in Shepton Mallet, it happens to be on the way to my besties house, but Alex never wants to make a quick diversion…! God that’s beautiful. I want it! Ahhh glad you finally took the plunge! My Mulberry was a sort of ‘well done for holding a proper job for a year’/’omg I’m 25’ present and I thought it was the best time in my life to buy it. My discounted way of buying it did rely on knowing someone who worked there, but I was definitely considering the outlet after visiting with Carrie and Lucy last year. I am so so jealous! I remember when I was about 16 I always used to say to my friend that we would know we’ve ‘made it’ when we have mulberry bags haha. Neither of us has one yet but one day, one day. It’s lovely! I think it’s great that they have outlet stores to sell marked items at a reduced price. I’d hate to think other brands just throw the bags away?! Gasp! This is going to last you forever and a day so it’s a great investment. It’s gorgeous. I’m sure you’ll end up getting £1 a wear out of this bad boy! Oh wow, it’s gorgeous, I’m sure you’ll get lots of wear out of it! My husband (then fiance; I like to mention that distinction so people still assume I’m young) gave me a black Roxanne for Christmas two years ago. It. Is. DIVINE. It’s an old shape, especially compared to the Alexas & Del Rays, but I’d wanted on for seven years & I can fit a ton in it. Ages beautifully & never dates. I’m looking to purchase my second Mulberry Handbag & it’s a black Hobo (medium type) with the platted handle. I live in Derby and have been to Bisceter only once to buy the Baswater, which store do you think would be nearest for me and I need to go when there is a sale on as I’m on a tight budget and have been saving for just over a year now. 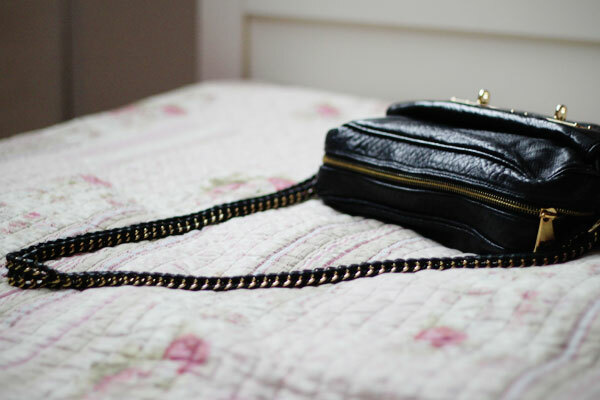 I’m really lucky, I have a Charlie clutch in patent black with silver hardware, a del Ray in black with brass hardware (my most expensive one), a east west Bayswater (my first one and still my favourite), a purse to match, a daria hobo in oak (can’t wait for it to come out for summer!) and a purse to match in fusion, a belt, a phone cover and a heart keyring! I have a hubby that likes buying me bags! He bought a red effie hobo for me one Xmas but I swapped it for the delray. At the moment I am dreaming of a black croc print Bayswater with brass hardware, the Bayswater was the first bag I fell in love with but it was in patent red at the time in Bluewater and it was £650! This was a very long time ago! So, I’m working extra shifts in the hope that in the Boxing Day sale my dream bag is waiting for me! 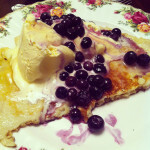 If not I’m hoping hubby will be sympathetic that it’s not there and contribute! hi jen ive just bough my first mulberry bag a big red patent roxanne bag i love it my treat as a birthday present fo me just got my new apartment too love mulberry looking at another bag normaly go for LV but fancied a change of designer bag. If you know what you want from a Mulberry outlet, you can sort it over the phone and they will post it to you. I saw a Black Congo leather Bayswater at Cheshire Oaks. 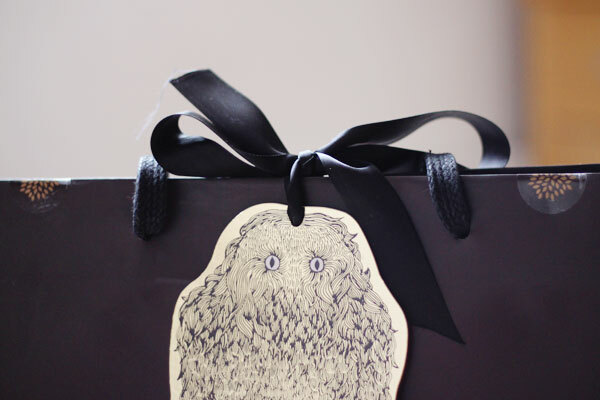 I told my husband about it, he popped into a Mulberry store in London, and between the store and the outlet, the purchase was made and delivered, beautifully packaged, to our house. Splendid service.